Keywords with low competition is the only source to rank blog and posts in SERP's for new bloggers or SEO hungers. All webmasters are aware of this fact but the actual problem is there that they don't know to find these type of low competition keywords. In this article, we’ll talk about the benefits of finding low competition keywords, which are most likely to deliver a great return on your investment of time and also talk you through exactly how to do it. Do you think like, More searches mean more traffic on blogs! But there are two major problems with this approach. One is that it’s a highly competitive area and the second one is that it isn’t particularly targeted. I will make you clear all the facts in this post. Before proceeding, I want to clear some points... Who should read this post and for whom this post would be more benefitted? You want to rank your blog or site higher in Search engine result pages. You are an Adsense Publisher and want to increase your CPC and CTR. Long tail keywords are those three and four keyword phrases which are very, very specific to whatever you are selling or writing. Long tail keywords with 50 searches a month is better than the short keywords with 50,000 searches. There are many tools available for blog owners to find Long tail low competition keywords with high Cost per click rates. Unfortunately, most of them are paid and if some of them are free then the data they provide is not accurate at all. Again start worrying? But why, I am here to provide you the best tool for free. This won't cost even a single penny at all. Here, I am asking about Google Adwords Keyword Planner. You may have heard already about this tool. But I can challenge, you won't have full knowledge to use this tool. This tool was designed by Google for the Adwords user or their Advertisers to get the details and statistics of keywords before bidding. But we can also be benefitted with this tool as blogger and web owners. Last week I got queries and questions from readers of Tips2secure asking for the tool to find and do keyword research. I recommended them to use this Adwords keyword planner tool. But later, I got a reply from one of them with this message, "Sir, it is a paid tool and asking for money pls suggest me some free tools". I was also in the same situation when I was using this tools for the first time. You are lucky as you won't face the situations like that. I will give you step by step guide to use that tool and I'll also add a video tutorial in this post. 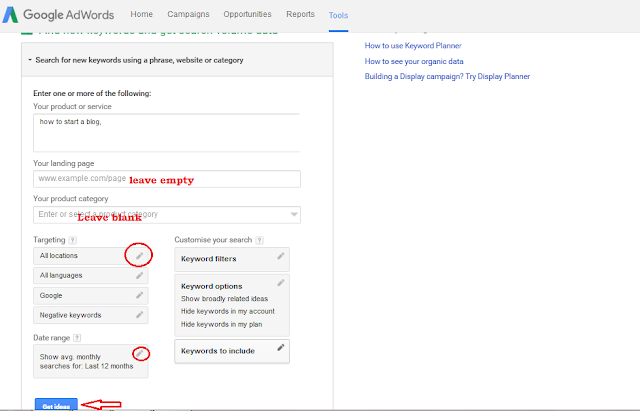 Open this link to explore Google Adwords keyword planner. Sign in using your google account Id/Password. Click on ' Search for new keywords using a phrase, website or category'. Type any keyword related with your niche to get Ideas as shown in below image. It will show you 'Ad group ideas' and 'Keyword Ideas'. You have to click on 'Keyword Ideas'. Competition Level Data shown in Google Adwords Keyword Planner is not for PUBLISHERS, it is for the ADVERTISERS. Read this post to know in detail. Don't go exactly with the competition level data as suggested in this post. How to select and choose keywords? Always choose keywords having less competition and higher CPC. Never go for high competition keywords, medium competition keywords are also not recommended if you want to get better results. If you follow this tutorial and use this tool to do keyword research then surely it will help you to rank your blog and sites. Message: I hope that you have enjoyed 'A Guide to Find Low Competition Keywords with High CPC' article. However, if you want me to deliver more items, then please share my post. You can use Social Sharing Widget provided at the end of every post. After all, Sharing is Caring! I am not agree with your comment. I have used the tools like semresh and moz also, and it's reality that nobody gives the perfect data. All are estimates but it's truth that Google Adword planner is the best...and moreover it is free and easy to use. Even I also and always use this google adword keyword planner tool to target and find appropriate keywords. 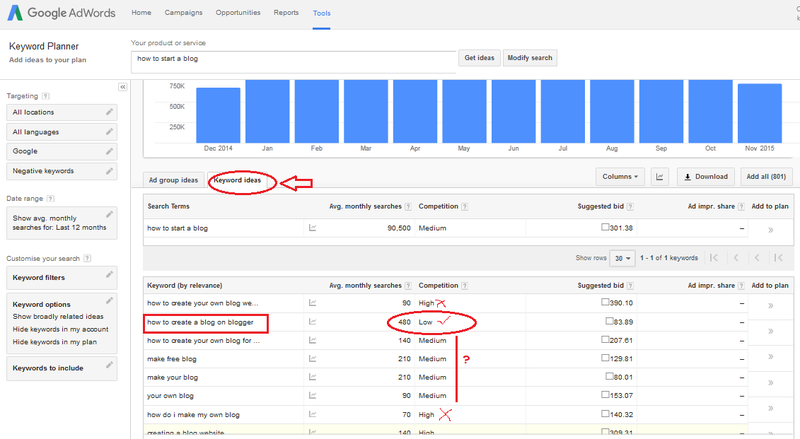 How to use google keyword planner for see exact month search not in 10-1k. Please suggest way without add credit card in Google adwords.